Spice up your Christmas tree with beautiful homemade ornaments . A little bit of paint added to the inside of a Christmas ornament spices up any winter evergreen. This is a really simple way to get more from old or broken ornaments. Here is an easy project that any beginner can create with great results! 1. Remove ornament collar. 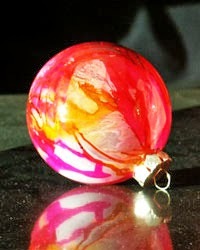 Drop a few beads of any one of the paint color of your preference inside the neck of the ornament. Working quickly, turn the ornament with one hand and begin blowing the paint around with the tip of the compressed air slightly inside the ornament. 2. Repeat step 1 with another bead or two on the opposite side of the ornament. 3. Add a different color, (repeating step 1) to the empty sides of the ornament. Several colors can be blown inside, just be carful to use colors that when mixed do not make mud. The colors will in some cases, blend to create a new color (ie. blue & yellow make green, magenta & blue make purple). The ornament at this time is completely transparent. 4. When you're happy with the amount of paint "spidered out", take a cotton swab dipped in a color (any color is fine) and begin dabbing the inside paint with this color. This will create rings because the Piñata paint is an alcohol base paint and it will repel the underlying paint to create additional texture which makes the ornament very interesting. 5. Take the airbrush, add white acrylic paint to the airbrush paint container, attach to the airbrush, insert the tip into the ornament and begin to lightly spray the inside. Do not spray too much paint or it will not dry properly and create a mushy effect. This is your background and it really accents the design created with the Piñata paint. You can use other acrylic colors (gold or silver) but white really brings out the brilliant Piñata colors. Spraying two light coats, hours apart, and using a hair dryer helps dry the inside. Let air dry for a day with the collar off. 6. The ornament at this stage can be left as it is or accented further with Lumiere gold paint on the outside, following the designs created on the inside. You can put Lumiere paint inside an applicator bottle with a metal resist tip and use the smaller lines to create additional accent. The end result is a beautiful, bright "one of a kind" ornament that is really unique.